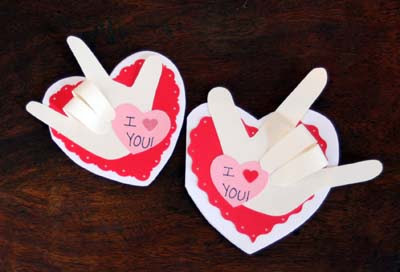 This cute card is easy to make! 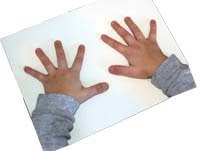 Grandparents and Parents LOVE it because it uses your child's hand! First Trace your child's hand, and carefully cut around. Then you can paste to pre-made cards, or make your own. I made the cards by folding a white paper in half, then tracing a heart shaped cookie cutter and cutting around, being careful not to cut all the way through the fold, so the card could open and close. Then I layered the Red heart on top, and added my Kids' hands. Fold the two middle fingers down, and glue into place. I used a glue stick, since Elmers takes too long to dry. If you have a problem getting the fingers to stick with a glue stick, try hot glue! It dries instantly, and holds very well. Just make sure only moms and dads use the hot glue gun. The hearts can easily be made larger for bigger hands. These are from my 3 and 1 year old. Very cute!!! I know my kids grandparents would love these!!! I Love Chocolate! Valentine Heart Cookies!